What does Consumer Reports have to say about the recent reveal? Many weekend warriors were pleased when Honda introduced its 2005 Ridgeline, considered a smaller, lighter pickup than its work-bred competitors. Rather than being a simple machine, like a conventional truck with a body-on-frame design and live rear axle, the Ridgeline uses unit-body construction and an independent rear suspension like a mild-mannered SUV. Customers flocked to it initially, but after a few years it seemed everyone who wanted an unconventional truck had bought one. Ridgeline sales faded so much that Honda dropped it from the 2015 and 2016 model years. This new one looks more conventional, with a longer, flatter hood and a flat-topped bed, rather than the sloping sides that consumers found to be obstacles when loading some cargo. But the Ridgeline retains the key ingredients of unit-body construction (sharing its architecture with the Honda Pilot SUV and Acura MDX, also owned by Honda) and innovative features like a tailgate that can swing open like a door or flip down in normal fashion and a lockable trunk-like cargo space beneath the bed floor. The independent suspension that makes the trunk space possible also contributes to a more comfortable ride and better handling than most conventional trucks offer—traits the new model should share with the original. The Pilot’s 3.5-liter V-6, rated at 280-horsepower, might be tweaked closer to 300 hp to make good on Honda’s claim it will out-accelerate the pack while its light construction yields better fuel economy. The proof will be in the final product, when it faces Consumer Reports’ tests. 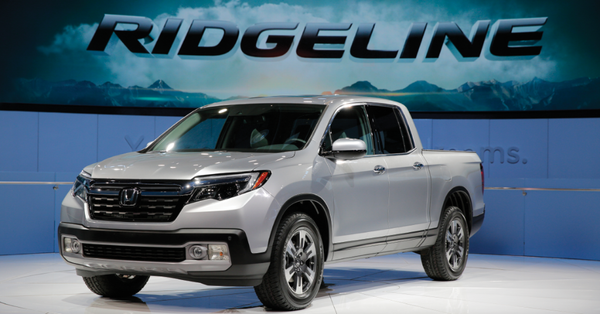 For the first time, Ridgeline will be available with a choice of front- or all-wheel drive. We considered the previous Ridgeline to be among the best compact pickups we’ve tested. A supple ride, agile handling, responsive engine, roomy cabin, and clever bed gave it real appeal. We hope these virtues remain as Honda aims to be more trucklike in appearance and ability. Visit Honda’s website for more information on the 2017 Ridgeline.